The Adelaide Convention Centre ACC celebrated its 30 years of activity in 2017 by the opening of the last phase of its expansion, the East Building, designed by the architectural office Woods Bagot. 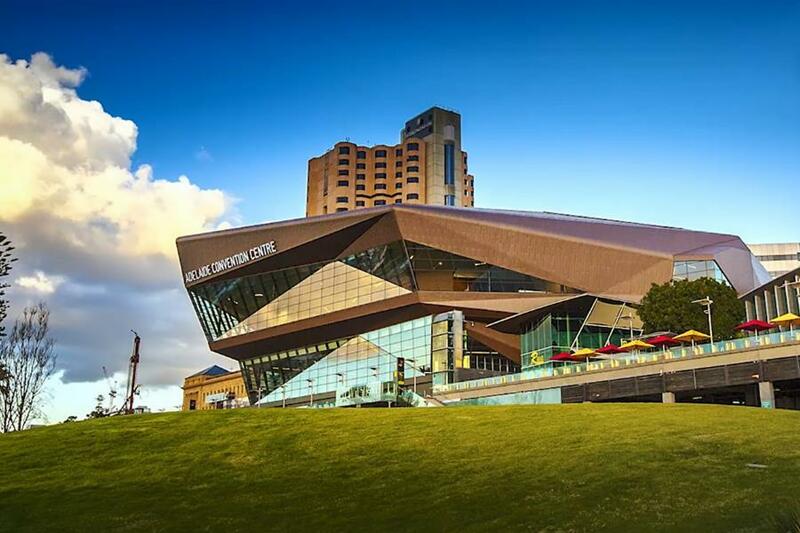 During the last three decades, the ACC has gained global recognition for its excellence and service and was essential in the consolidation of South Australia as a favourite destiny for business and event tourism. Located in the Riverbank district, a landmark of the historic city, the ACC celebrates its 30th anniversary revealing its new face thanks to the termination of its complete renovation, including two new buildings which expand the original and whose stunning volumes completely transform the river Torrens skyline. To minimize loss of income and interruptions originating from the impact of building works on the original building, the extension was designed in two phases. The design is based on a very detailed functional diagram that offers maximum flexibility and adaptability. It’s a completely integrated facility that includes 3 different and individually iconic buildings which connect internally so as to hold an individual event or three separated simultaneous events. Its striking exterior shape, comprised of undulating structures and facades is inspired by South Australia’s landscape, particularly by the ridges and the colours of cliffs, rock formations and steep hillsides of the Flinders mountain range (West Building) as well as the shapes and silhouettes of The Remarkable Rocks of Kangaroo Island (East Building). The design of the East Building results from the constraints of the site and has been “moulded” by the panoramic views, circulation and the environment of the river Torrens. Its external shape and red coloured zinc cladding were inspired by the granite rock formations known as The Remarkables found on the Kangaroo Island, near Adelaide. The building is divided in two levels, with an effective surface area of 8.700m² equipped with a new Plenary Hall with capacity for 3.500 guests. It includes a series of features that enhance its flexibility, being able to change into 15 different configurations to adapt to the needs of each event. The building’s sculptural exterior shape was made using triangular surfaces which together generate multiple faces, emulating the many crystals of a geode. To create an envelope which would fit over such complex shapes, a high-tech multi-layered system was chosen that guarantees the proper waterproofing and heat insulation required for the building to function efficiently. This includes sandwich panels such as Kingspan PIR with foam joints and nodes sealed with a weather-resistant wrapping, covered in a self-adhesive rubberised asphalt waterproof membrane, followed by air mesh mat (structural underlay) and pigmented elZinc® cladding shingles which adapt perfectly to the multiple folds of the building’s exterior. 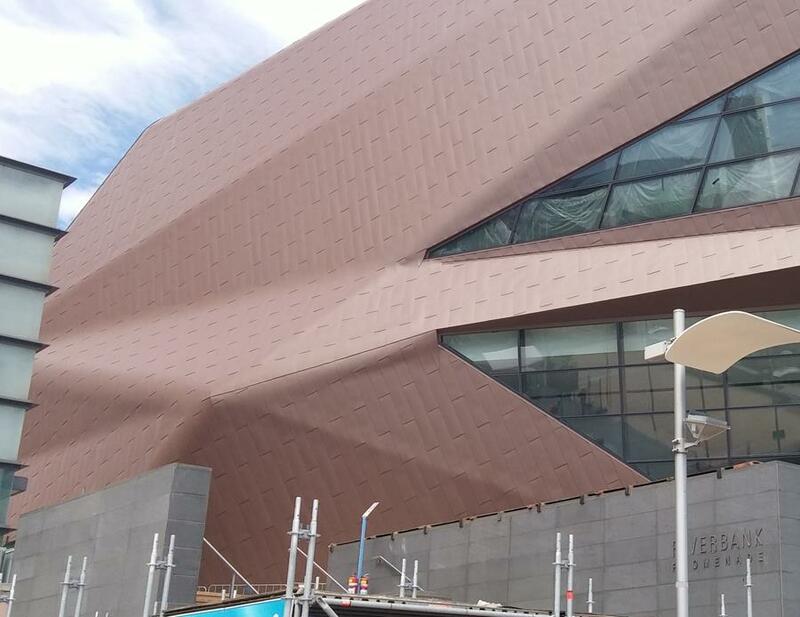 One of the most complicated issues that had to be addressed by the cladding package was the transition between different folds of triangular surfaces, whose edges had to have a slightly curved shape without creating creases or kinks on the zinc sheets. To further complicate things, the curvature in some of these transitions is gradually reduced from one end of the edge to the other. As well as properly preparing the base with an appropriate curvature, a decision was made to pre-curve the zinc shingles before their fitting, in order to avoid any buckling along the edges and guarantee a smooth transition from surface to surface. The critical points in the cladding are located in the corners and especially in the area known to the project team as “The knott”, where six edges meet, making it impossible to maintain the continuity of the zinc cladding. To resolve this problem the use of a joint to ‘stich’ the shingles together was chosen, starting at the corner and following the edge with least inclination to seamlessly join the line between the glazed area to its right and the zinc immediately above. This way the ‘stitching’ seems to be part of the design and blends perfectly with the geometry of the area, without drawing attention to itself and ruining the detail. The outer skin of the East Building was clad with red coloured zinc shingles manufactured by elZinc®. The building’s exterior appearance and its defining colour respond to the design intent of the architects, evoking the rocky formations from Kangaroo Island known as The Remarkable Rocks. elZinc Rainbow® Red was the material used for the exterior cladding with a thickness of 0,7mm. It was supplied by Zinc Ibérico in 600mm wide coils that were used to manufacture the more than 10.000 handmade elements which were fitted on site. The fitting of the zinc elements was undertaken using the flat lock technique, also known as shingle cladding, in a vertical orientation. The cladding is secret fixed, using stainless Steel clips that hook into the hemmed edges of each shingle, that are then secured back to the substrate by corrosion resistant rivets. This creates a very subtle jump of 5mm or so between the shingles, ideal for surfaces with multiple folds. 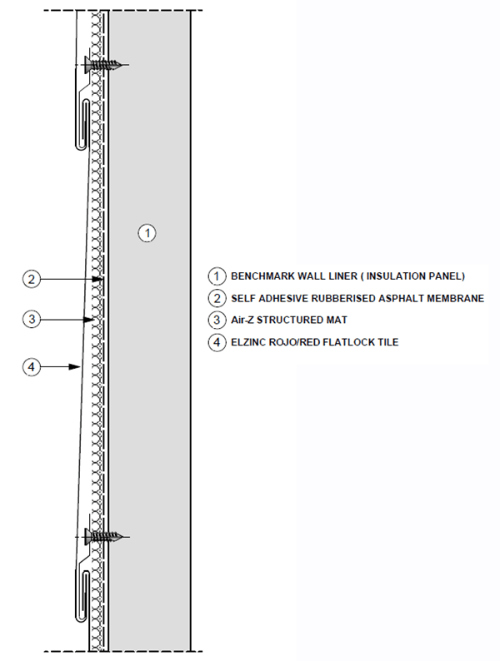 The flat lock is achieved by forming a 180º return fold (hem) along the perimeter of each panel. The dimensions of the fold tend to vary from between 23mm to 30mm. elZinc Rainbow® is a zinc-titanium rolled in accordance with the European EN988 and American ASTM B-69 standards, manufactured from pre-weathered zinc elZinc Slate®, treated with mineral pigments. Its 35 µm of organic coating provides it with additional anticorrosion protection turning it into an exceptionally durable and aesthetically attractive product. Stuart from Woods Bagot explained that elZinc Rainbow® red proved to be the perfect cladding material for the building. “It’s lasting and malleable, able to follow the curved, folded shapes of the building. Zinc is a plentiful resource, it is non-toxic and 100% recyclable” , he declared. The external shape of the building and the red coloured zinc cladding were inspired by the granite rock formations known as The Remarkables. It’s a long-lasting light-weight constructive solution that is almost maintenance free. The sheets can be arranged in many directions and geometric shapes, offering multiple design possibilities adaptable to the desired architectural intent.